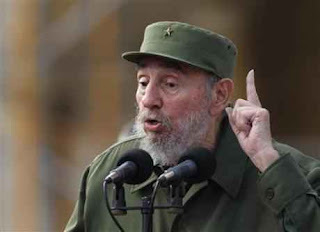 (Reuters) - Former Cuban leader Fidel Castro blasted the U.S. government for warmongering on Tuesday with the same kind of rhetoric he used half a century ago at the outset of his ideological feud with the United States. Castro, 84, who reappeared in July after a four-year absence due to a serious illness that forced him to hand power to his brother, spoke to a crowd of 20,000 people in front of Cuba's former presidential palace on the 50th anniversary of the creation of Cuba's neighborhood vigilance system. Castro quoted extensively from a speech delivered at the same location on September 28, 1960 in which he spoke of Cuba's moral superiority and the cowardice of the United States, whose leaders he said had "long fangs." On Tuesday, he warned of an apocalyptic future of nuclear war and environmental destruction with capitalism and its chief proponent, the United States, as the primary culprits. "The world has to know -- if you see the theories they have, the plans they have and the military doctrines they have, it would make your blood run cold," said Castro, who wore green military clothing and a cap with a silver star on its front. "Everything they do leads to war," said Castro, who spoke for more than an hour, first from a prepared speech, then in impromptu remarks. Castro frequently attacks the United States in columns he writes for state-run media, but his harsh words on Tuesday contrasted with the more subdued criticisms in speeches by his younger brother and successor, President Raul Castro.